"The product meet my needs for a mini wallet in the front pocket." 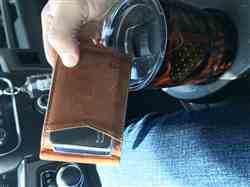 "Excellent product and I will order more items in the future..."
"This is exactly as described, great quality leather, money clip holds cash/receipts securely, and fits perfectly in a front pocket. Will be ordering a second one for sure!" "Love it. Better built than my almost identical previous fossil wallet. " "Great wallet! Would buy again." "I love this wallet. Best I’ve ever had for front pocket use. Well constructed and well thought out. Holds all my cards and cash without bulk. " "Everything thing they claim it to be couldn’t be happier "
"Nice bill fold, fits all my cards and is nice a small too. Seems to be well made. I got the gray and it’s very nice." "The wallet is very thin with 8 cards and cash in it. Perfect, especially for the price!" "I looked for a while trying to find my husband a new wallet. He wanted something smaller but that would still hold what he needed. This wallet does just that. It’s made very well and made the eldest gift for him. I knew it was going to be great from the moment I opened the package to see how much care was giving in just the packaging it’s self." "So far so great! Plenty of pockets for my cards, no wasted slot for cash, who carries cash any how? Slim as can be! I’d probably choose a darker color next time." "I carry a lot of plastic and other credentials in my wallet that typically leads to a huge bulge in my back pocket. The Bryker Hyde Executive Side Flip has forever changed that. Slim profile and quality leather makes for a wonderful user experience. I'm sold on these wallets forever!" "Great wallet, very satisfied with this product. " "Wanted a smaller wallet that I could carry in a front pocket and still hold 6 or 8 credit cards plus ID and insurance cards and some cash. So far this has worked great." "Great overall experience with ordering as well as a speedy delivery time. On top of that the wallet itself is great, I love this product. " "This has been a very nice and unique wallet for me. I'm loving it at the moment!" "This wallet is beautifully made. It is also great in its function and design." "I purchased this wallet for my girlfriend because I really like the Bryker Hyde wallets I own and their quality. Plus, the Lime Green color was too much to pass up. When her wallet first arrived, it was fun watching her transfer cards and such to her new ‘favorite’ wallet. The Costco card, driver’s license, credit card holder that comes with the wallet is such a great feature. In fact, we have nicknamed it the Costco wallet because of the perfect size for just going in places. So easy to just grab that out when going shopping or to a restaurant. I’m glad we have the safety of RFID built in to our wallets and they are so well built, I can’t imagine having to buy another wallet for a very long time. Thanks for being there for us and inviting us in to your lives, Bryker Hyde." "So far I’m loving this wallet. It’s high quality and fits exactly what I need in a wallet. " "Honestly, I had an amazing experience even down to the shipping haha. I got notified every step of the way to my house. And when my Wallet arrived, I opened up a neat logo embossed box containing the wallet. If I’m being picking.. the box could look more elegant with a premium box, but it’s the thought that counts. Anyways the wallet was as smooth as I expected and was exactly what I wanted plus more. The money clip thing that goes inside the wallet is fun to take out and mess with while I’m bored adding that extra 1%. (Don’t judge me; you’ll do it too. Get one and you’ll see) In conclusion: This is my Bryker wallet, there are many Bryker wallets like it, but this one is mine. And I love it. Shoutout to the great state of Texas! " "Great wallet. Fits everything I need. Excellent quality. " "The experience was great! Quick delivery. Product almost exactly as advertised. It was just a little bit wider than anticipated. I would buy another one." "I will never buy another wallet made by anyone other than Bryker. The leather they use is second class to no one. I am very impressed with the stitching and feel. I've had this wallet in my back pocket for 6 months. it has changed colors just like real leather should. I absolutely love it. If I ever need a new wallet I promise you I will get another from these guys. Whatever my leather needs may be in the future, I will think if them first. Super impressed"
"The design is exactly as hoped for and soft to the touch. It only took a week to break in, now when I need a card it slides out easily but still snug and secure while inserted. Thank you for this very fairly priced addition! " "I had a regular bifold wallet, but wanted something RFID resistant. A few years ago I picked up a carbon fiber card holder with a money clip. I never liked it because of the sharp edges. I came across this minimalist design and decided to make a change. I've had it a couple of months now and can't imagine having anything else. The design with the cards and ID on the outside are amazing. The removable internal money clip is ingenious! It's amazingly thin even with 10 items and the leather's soft and at no risk of scratching my phone. I'd recommend this without hesitation!" "Great exactly what I wanted." "This slim wallet is very well-made. It holds 6+ cards, DL & other items. Really like the removable money clip. Have owned other slim, front-pocket wallets, but this is the best one by far. " "Replaced my old wallet after 10+ years. This one has held up well for the past few months. Card pockets have loosened appreciably in the past few weeks so now my cards fit."